Welcome to Long Night’s Journey Into Day, the documentary that takes you inside post-apartheid South Africa to give you an intimate look at a country’s attempts to heal itself with truth as the balm. On January 30, 2000, this 35mm film, directed by award-winning, Bay area filmmakers Frances Reid and Deborah Hoffmann, was awarded the Sundance Film Festival Grand Jury Prize for Best Documentary. For more information about the award, please visit the Sundance Film Festival’s online home. On this web site you will find in-depth information about the Stories the film chronicles. Wondering when Long Night’s Journey will screen in your area? Click here for Screening Dates. You can read News and Reviews on what the critics have to say about the documentary. The filmmakers reveal their motives and experiences in creating the documentary in a Filmmaker Q&A. Want to know more about the filmmakers and their previous works? Production Credits tell you all that as well as who did what in the making of Long Night’s Journey Into Day. to get in touch with them via email? Click on Contact Us. To catch a glimpse of the content, go to Sneak Previews to screen Quicktime movie excerpts. 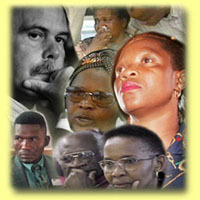 Want more in-depth background on apartheid? The History page provides an historical context in a scrolling timeline. If you would like to order a copy of Long Night’s Journey for your school, university or community organization or to schedule a theatrical screening, please contact one of our Distributors. Shot over 2 1/2 years during 8 trips to South Africa, Long Night’s Journey Into Daytracks the human drama of just a handful of the 10,000 requests for amnesty that came before the TRC. In exchange for absolute truth about their activities and human rights abuses, perpetrators could earn amnesty for the crimes they committed before Apartheid collapsed in 1994. Long Night’s Journey Into Day takes viewers to the hearings where murderers meet the surviving family members of their victims in four cases: The Amy Biehl Story, The Cradock 4, the Magoo’s Bar Bombing and The Guguletu 7. The stories in the film underscore the universal themes of conflict, forgiveness, and renewal. A white special forces officer, deeply remorseful for the crimes he committed, struggles to reach peace with the embittered wife of a black activist he killed 14 years ago. A group of mothers, after enduring years of misinformation and denials by the authorities, learns the truth about how their sons were set up, betrayed, and killed in a vicious police conspiracy. A young black activist comes to recognize the anguish he caused by killing a white California student during a mob riot, while her parents see past their pain to embrace a new, multi-racial South Africa. The TRC is raising some of the most profound moral and ethical questions facing the world today – questions about justice, truth, forgiveness, redemption, and the ability ofbrutalized and brutalizing individuals to subsequently coexist in harmony. As it emerges from its tragedy, South Africa is showing the rest of the world that even the most bitter of conflicts can be addressed through honesty and communication. LongNight’s Journey Into Day is witness to history in the making.